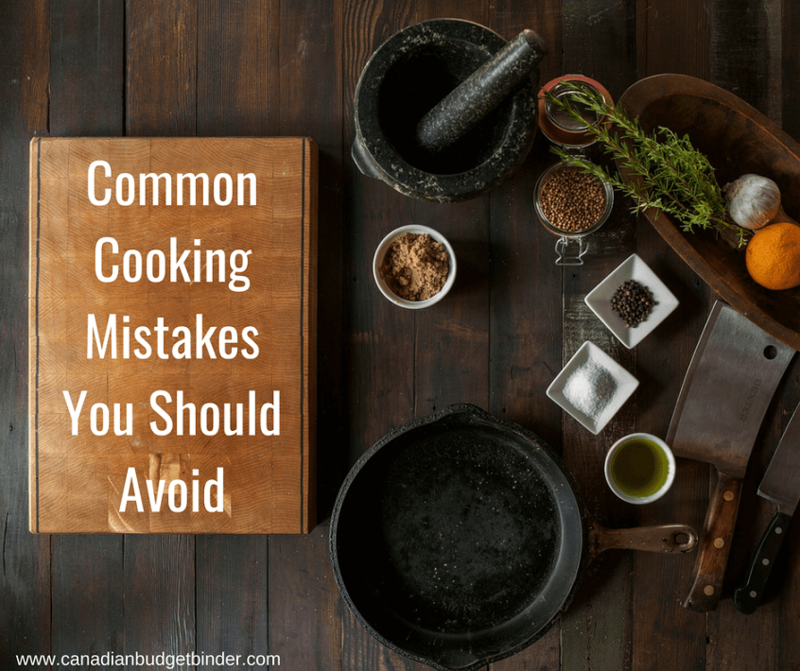 Cooking mistakes may lead to food waste which is a big problem in Canada an around the world. With so many people suffering from starvation it’s important to keep in mind that the food on your plate is food that someone else would love to eat. That doesn’t mean if you don’t like something that you have to eat it but to be cautious about the way you meal plan, prepare food and portion size. Just recently we were at my sister-in-law’s house for dinner which was amazing as always and before we left she offered us leftovers. She has the tendency to make far more food than needed but I think that’s just so she can send it home with us. We’re fine with that though however she did mention that she has a large grocery bill which led us to discuss a few things about her food planning which I will talk about down below. Another thing she did before we left was offer us a massive bag of mini meatballs that she made for the boys but they didn’t like them. That meant either we take them or they end up in the garbage, so we took them.The boys thought the meatballs were too chewy and didn’t like the texture. Was there something she could have done to save the mini-meatballs? I fried up a few of the meatballs and had to agree with the boys the texture was off. What I found out was that when she tried to make the meatballs into mini-meatballs she over-rolled them which caused the meat to toughen up. All we had to do was make sure the mini-meatballs were cooked long and slow in a pot or you can use a slow-cooker to bring them back to the texture that was intended. This may not always happen but it certainly worked in this case and we made a magnificent pasta sauce with meatballs and a meatball soup. The same will happen if you don’t allow meat to rest after cooking or grilling it or not cutting it against the grain. This allows the juices to run out and the result is dry meat. Failing to use a meat thermometer may result in your food being cooked too much or under-cooked. There are some kitchen tools that are very important for every kitchen to own for the very reason of avoiding cooking mistakes. I know this because I have done the same before and learned over the years from trial and error and lots of food prep education. You don’t have to go to culinary school to learn about food prep especially when we have Google at our finger-tips. The only way to bring those perfectly round mini-meatballs back to life was to add them to a slow-cooker or pot and let them simmer for a few hours. This is when Mrs. CBB and I questioned how we could limit or eliminate food waste when it comes to prepping food in advance for the freezer especially for our picky little eater at home. What happens if you add too much of an ingredient such as spices? It won’t taste right and it deviates from the recipe and may lead to food waste. Well making an error such as too much spice or the wrong spice most certainly may call for food waste but there are some tricks that you can use. If you add too much salt for example add a potato to the pot or frying pan because it will soak up salt like a sponge. On the other hand if you add sugar instead of salt well you might have to get creative with the dish or risk having to waste it. If you are making oatmeal cookies and accidentally add paprika instead of cinnamon don’t panic and throw the batter away. Add the cinnamon that was supposed to be there and bake them up first. You never know if they will taste delicious. This is how recipe creation happens sometimes, by making mistakes. If you add too much sugar to a recipe you can balance the sweetness and restore flavour balance in a dish by diluting the sweetness and increasing the ratio of other ingredients, according to Spiceography. Another way is to increase acidity especially if you’ve added too much hot spice or sugar which I admit I’ve done a few times. You can also do the following if you’ve added too much sugar to a recipe. I know that some people get over-excited about cooking and jump right in but you must prep the ingredients first. When you watch cooking shows on television or You Tube videos the chefs will always have the prep work done first. This is imperative for a couple of reasons one being you have all the right ingredients and the correct measurements ready to go. The last thing you want to be doing is finding and using one ingredient at a time (I know some of you are smiling because you do this) only to find you are missing something or you rush and add too little, too much or the wrong ingredient to your recipe. If you read a recipe and aren’t sure about the cooking terms used or certain ingredients, Google it as I’m sure you will find the answers you need. If not there’s no harm in asking a friend or family member for advice. If you can’t tell what an ingredient is from looking at it then it needs a label. Imagine going into the bulk food store and having to guess what everything is? That’s how some people navigate their kitchen and we’ve been there and know that it adds extra stress to meal prep time. Back a few years ago I had more than enough cooking mistakes to know that I needed to label our spices. Not only did I go out and buy medium-sized mason jars but I also purchased labels to attach from the jars. Some of the best labels on the market are those that are water-proof which is why I’ve ordered new spice labels from mabelslabels.com . I noticed that the labels would get messy or peel off during washing or meal prep so spending a bit more on a label was important to us. Think of the potential food waste you are saving by properly labelling spices and items in your pantry. No more mistaking ingredients. Look what happened to some of my readers…. Charlene Hogg My sister-in-law used icing sugar instead of corn starch for her Christmas gravy. Heather Salter I used Taco seasoning instead of cinnamon in a pumpkin cheesecake. Elizabeth Hersey I used cocoa instead of cinnamon in my cinnamon buns. Whatever you do, taste the food you are cooking as you go along. Don’t wait until the end or even worse forgetting to taste it at all. Serving food that is under-cooked, too tough, over or under-seasoned is a big no-no. When I’m cooking I make sure to have a cup of spoons by the stove and taste as I season to make sure that flavours are where they are supposed to be. Never use the same utensil twice because that’s like double-dipping and no one likes that. This is when you will figure out whether you need to add seasoning or you may find out you’ve added sugar instead of salt. An important lesson is to be learned here, always taste your food as you go. I know many of you out there (myself included) at times like to eye-ball measurements but if you want a true recipe to turn out as written you have to follow it to a T. That means if it says 1 tablespoon of pure vanilla extract, add one tablespoon or risk the taste being off or too powerful. I’ve went ahead and added the end of a bag of flour to a recipe thinking that little extra wouldn’t make a big different, boy was I wrong. It may not always mess up a recipe but in my case with a cake it did and came out too dry. Always be aware of the time needed to prep, bake or cook a recipe and don’t deviate unless your cooker or elevation level is different from that of the recipe creator. This can be tough especially if you don’t know which is why it’s important to always test what you are baking or cooking before you shut everything down. If I’m baking a cake for example I will stick a toothpick in the middle to see if it’s done. If the toothpick comes out clean I know I’m good. If I notice that the top is getting too dark I add a sheet of aluminum foil over top to stop the darkening process until the rest of the cake is baked. When I bake bread I use the finger cushion test where I test the middle of the bread to see if it springs back at me. It always seems to work perfectly. We have an old-style oven so we are extra careful about watching what we cook and bake because new technology and old technology just isn’t always the same. When I first moved to Canada I had never used a gas BBQ grill before and I was envious of those grill marks that my father-in-law would always make on his burgers and steaks. One time we had the family over for dinner and I was going to show off my grilling skills when he told me, “Stop flipping the meat so much”, leave it be and he showed me how to get those grill marks. Too often we play with our food, handle it too much (as in the case of the mini-meatballs) or whip, stir, beat, roll or knead ingredients that don’t need that much play time. I often notice when frying in fat that if I turn let’s say a grilled cheese, breaded fish or other meats too early I won’t get that lovely crust on the outside. Instead I get a soggy mess and that’s not pleasurable to eat at all. Mix your cream too long and you won’t get whipped cream, you’ll make butter. I’ve done that before. There are a few distractions that have led me to making cooking mistakes in our kitchen. Last week the door-bell rang just as I was toasting almonds for our salad that night. Well, they survived but they were dark and if I hadn’t caught them on time I would have had to come up with a way to use them in a recipe or toss them in the bin and I don’t like food waste at all. I’ve learned a few things before cooking, ignore all technology unless it is needed for the recipe. Don’t answer the door unless you’re quick and let the person know you are cooking. If I’m alone with our son I make sure he is in the kitchen with me and doing crafts or something that will keep him busy and not constantly asking me questions. I let the answering machine get the telephone and try to do the bathroom thing before I start in the kitchen. Sometimes there are those cooking mistakes which force you to start over but at the end of the day you’ve learned a lesson that you hopefully won’t make again. Besides, mistakes often lead to creations. Don’t be afraid to get in the kitchen and cook just be aware of basic cooking skills and you’re good to go. Discussion: What other cooking mistakes could you add to this list? Share in the comments below. This will be a no-shop week for us as we were given some garden delights from a friend of ours. We have cucumber, romaine lettuce, tomatoes and zucchini for the week now. I can’t believe that the summer is nearly over! Where did it go? Is my laziness showing? This is a NO SHOP WEEK for us. I still have potatoes, carrots, 2 different types of apples, lemons, limes and a honeydew. There’s lots of frozen vegetables in the freezer so the clean-out continues for another week.